Do you think Gluten free all purpose flour would work here? Hi Emma. Sadly GF flour won’t work with this recipe. I tried it once and the buns came out rock hard 🙁 Sorry! Just made hot cross buns for the first time ever using your recipe. They taste yummy but I have a couple of dilemmas. 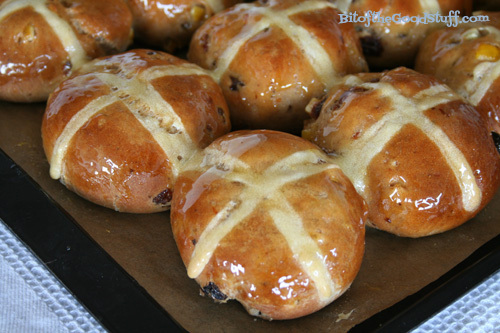 Firstly, a number of them split on the top and all of my crosses disappeared into the dough whilst baking. Do you have any suggestions for how to improve? The crosses were quite thick and looked good when I popped them into the oven. We are currently living in America where it is difficult to find a hot cross bun, so I’d like to improve them for next week. The glaze is excellent! Hi Kari! 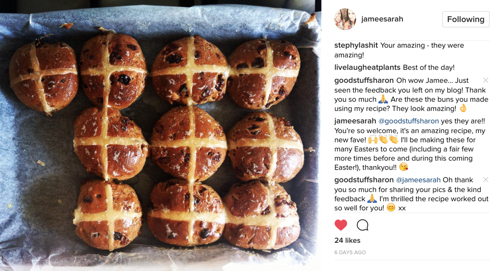 Great to hear that the buns tasted yummy! I’m sorry you had a couple of technical issues with the buns. I’ve not experienced these issues myself but I had a quick look on google and a couple of people have mentioned that hot cross buns can crack if they are under-proved. So, if you do try them again, it might be worth leaving them to prove a little longer and see if this helps. Hi Jamee! I’m so pleased that the buns worked out well for you! And thank you so much for stopping by the blog to give feedback. I really appreciate it! 😊 I saw the photo you shared on Instagram and the buns look spectacular!!! Hi Renee! Thank you so much for your feedback! 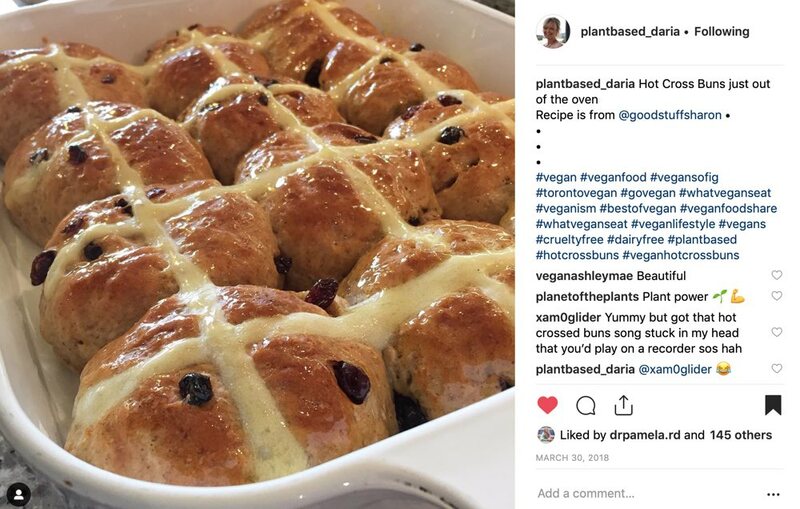 Sounds like the buns turned out just perfect for you 🙂 I love the idea of adding cranberries to the dough. I definitely need to give this a try next time I make them. i want to make these for easter I’m just trying to figure out if i should make them the day before or the day of. if i make them the day before whats the best way to heat them back up? Hi Rachel! It should be fine to make the buns the day before and store them in an airtight container. Before serving, I slice them in half and pop them under the grill to lightly toast them on both sides. I then add a little vegetable spread/butter and they taste wonderful as it melts into the bun. 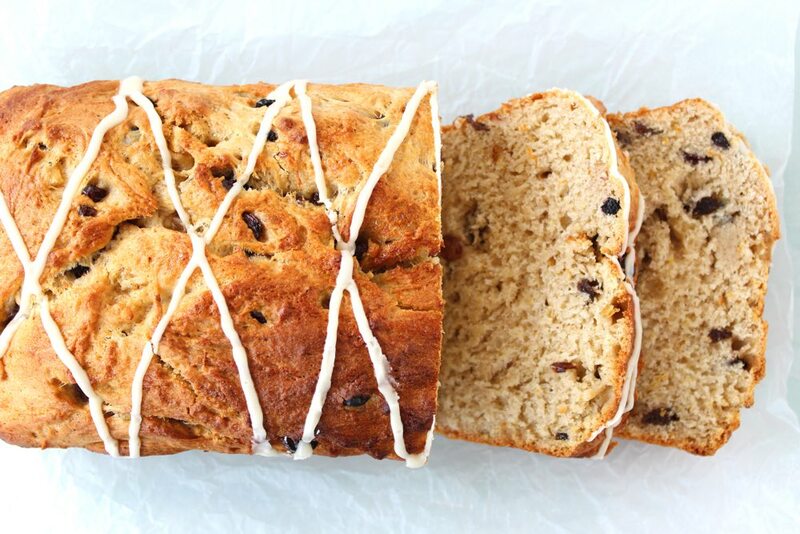 I just made your Hot cross buns and they turned out absolutely perfect! Thank you so much for the recipe, this will definitely be a yearly tradition from here on! Have a wonderful Easter! SUPERB recipe! 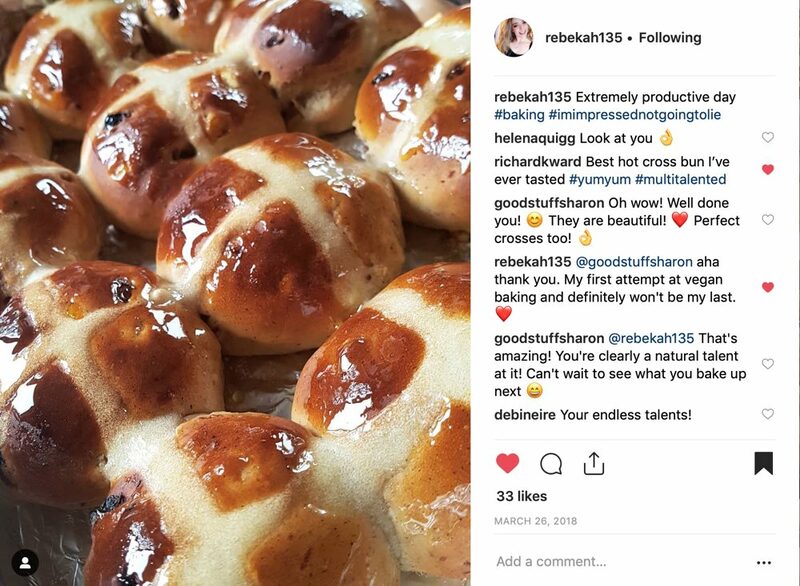 Made them last week for easter, they came out just very slightly harder than I would have liked as the second proving was a bit too hot I think. They went down a treat anyway and were so popular I am having to make another batch! Second lot in the oven and looking much better than the first. Adore these, as do my family and friends. Very special is the orange glaze, these beat non-Vegan any day!